My book club read Bad Kitty this past month. This book was different from our previous books, because it only loosely held a story; most of the book was an alphabet book listing various items Bad Kitty does or does not like to eat, etc. Nick Bruel has lots of projects and information on his Bad Kitty website, so we used the maze and the "how to draw Bad Kitty" pages from that site. In addition, I put out materials for kids to make their own alphabet books. I also placed colorful paw prints on the floor for kids to follow around. I've discovered that many of my kids enjoy having an active component to book club, so I try to make sure at least one activity involves more movement than craft. This week was our final meeting of our summer science club, and I saved the best (and messiest) for last. We watched a short video about polymers, then it was time to make our slime! Unlike previous weeks, for this program I led the experiment and asked the children and their families to follow along with me. Each table was set with a tablecloth (plastic, taped down, and disposable), three bottles of regular water, a handful of craft sticks, and several tubes of food dye. I explained what we were going to do, then had some volunteers pass out cups with about half an inch of Elmer's glue pre-measured inside. This allowed me to use the giant bottle of glue we had in the closet without waiting for everyone to pour their own, and passing them out meant that people had to wait to start their experiment so they were actually listening to me while I was talking. Once everyone had their glue, I instructed them to add an equal measure of water from the bottles on the table and then mix with their craft sticks. Next, we added food dye, in whatever combination anyone wanted. In order to make sure I knew that everyone was with me, I asked the children to raise their hand when they were done with a step. When I had almost everyone's hands up, I would proceed with the next direction. 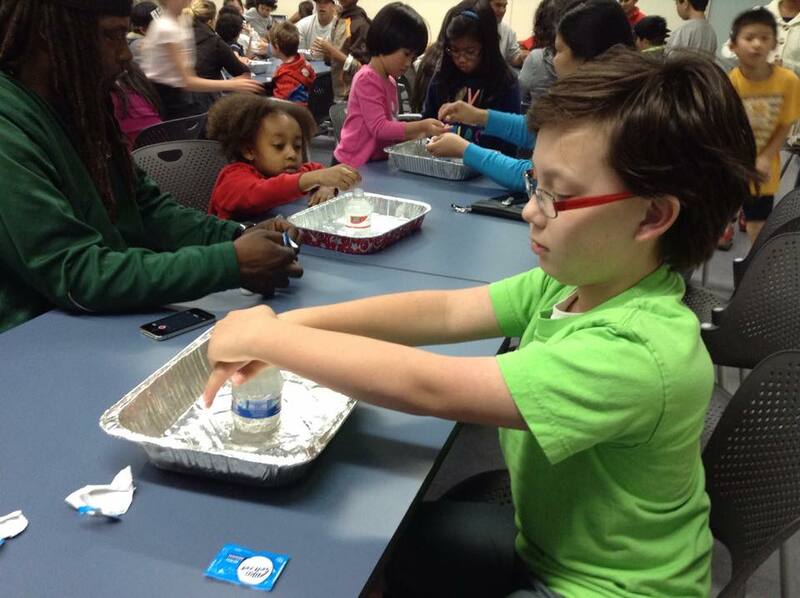 Next, I had volunteers hand one bottle of water/borax mix to an adult or teen at each table. They were instructed pour some of the mixture into each person's cup, and each person was then asked to stir their mixture again. This is when the glue became slime, and I gave the kids permission to take the slime out of their cups and play with it. I also set up two wipe stations in the back of the room so kids could clean their hands before leaving. Finally, I asked my volunteers to pass out containers for the slime. I used the plastic "bubbles" that often come from vending machines outside of grocery stores, but you could use Ziplock bags or something similar. The kids played with their slime and eventually stored it into a container to take with them. I gave the parents a recipe card so they could make the slime at home if they wanted to as well. While I circulated and took pictures, I made sure my volunteers and some older teens were on the lookout for latecomers who would need instructions and help making their slime. At the end, we removed all the extra water bottles and food dye tubes, then rolled the whole mess up into each tablecloth and threw it away. There was very little mess left to clean up. This week my science club studied bridges. After a quick video explaining three different types of bridges and the strength of triangles, it was time to get to work. I gave each table a stack of paper and a couple of rolls of masking tape. I explained that we'd have space up front for them to test their bridges, and that I had brought in encyclopedias to use for testing. Me: "It's like Google, but in a book instead." It was fun to watch how invested the adults were in this project. Many figured out pretty quickly that rolling the paper into tubes would help, and that extra tight/thin tubes made of multiple sheets of paper were probably the best way to go. They then used these tubes to make the parts of their bridges, and finally brought their bridges up front to test them. Because this was a labor-intensive experiment, I asked the patrons to work together as a table, and it was neat to see different families working together to create their bridges. In the end, happy children tested their bridges and carried them out the door, most with assurances that they were taking them home "to make them even stronger." You can access my bridge slide here. My science club studied airplanes last week. We talked about air pressure and how airplanes are able to fly, then it was time to try some science. I gave each table a stack of paper, a handful of books about how to make paper airplanes, and some questions, like "How does a long, skinny airplane fly differently from a short, fat one?" and "What could you do to your airplane to make it spin as it flies?" In order to control the chaos, I designated three locations for throwing airplanes. Two of them involved hula hoops which I had hung from the ceiling. The hoops gave the children specific targets to aim for, thus reducing a bit of the "random airplanes flying everywhere" that had been haunting my nightmares for the past week. I also suggested that the hallway would be a good place to fly airplanes, especially for children who wanted to test their plane on distance or wanted to race a plane against another plane. For this area, I gave the children a few common-sense rules: 1) Do not throw your plan if a person is in the hallway. 2) Let the kid who threw first go pick up his plane before you throw your plane. I explained that we don't want to hit people with our planes, but I wanted them to still be able to fly them. I've found that kids generally do well when rules are reasonable and explained, so we didn't have any problems with planes running into humans in the library. The child with the green airplanes is "patiently" waiting for the hallway to clear. This was another program, like last week's LEGO adventures, that lasted much longer than expected. Kids made several plans and tested them against each other or against planes their friends had made. Many of the display books and instruction books I had at the program were checked out. Happy kids with happy parents exited the library, excited that next week they could come back and try something new. My interns held the hoop steady to help the kids. Update: You can access the slides I used for directions / experiment questions here. This week's science club was all about motion. We studied Newton's Laws of Motion and then had time to build cars. The task was fairly simple: use LEGO bricks to build a car that can be powered by a balloon. I gave each child two LEGO wheel sets, one balloon, and a bucket of LEGO bricks to share at their table. It was really interesting to watch the parents and kids deal with frustration in this task. Many of the kids had ideas, but the parents all whipped out their phones to see what the internet had to say about this topic. I didn't want to squash their creativity, but in the interest of curbing frustration I made a LEGO car out of four pieces and two wheel sets that did exactly what it was supposed to do: it moved forward when the balloon it held was inflated. I showed this as an example only when a family or kid was so frustrated they were thinking of giving up. Once kids were able to make a successful car, though, they began experimenting in earnest. Now they could think about how to change the car and thereby change their results. Some of them raced each other. Some built a second car. It was hard to get everyone to leave at the end of this program, and many mentioned that they'd be repeating this experiment at home. And that is indeed my end game: inspire curiosity and wonder in kids so that they continue to do science even when they are not at science club. 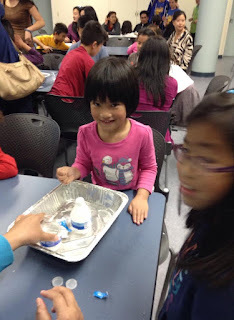 This week's science club was about buoyancy. 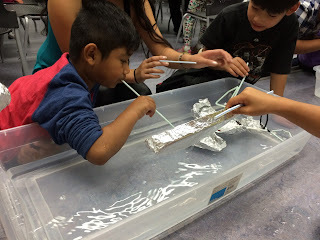 After a brief video on what makes boats float, I set the kids a task: create a boat that will stay up and can move through the water when you blow at it with a straw. It was really interesting to watch the way they approached this task. Many of them learned from last week's science club and created their boats out of aluminum foil, but there was a wide variety in the shapes and sizes of these boats. Of course, I had a couple of large tubs near the front of the room so the kids could test their boats on the open waters. I intentionally placed this activity after the previous one (make a boat that will hold passengers and not sink) and before the next one (make a LEGO car that can be powered by a balloon). I wanted there to be a logical progression where possible, and these related activities allow kids to try different methods to accomplish similar tasks. Indeed, I fielded far fewer questions this week than I had last week. You can access my buoyancy slides here. This is our brag board. Kids who finish add their names to a music shape. So, you've promoted your summer reading program, you visited all the schools, and you have lots of kids signed up and coming to programs. How do you motivate them to finish the program? 1. Offer prizes. Every child at my library who finishes summer reading receives a free book. They also receive a raffle ticket for a scholarship and several prize baskets, and they are allowed to finish as many times as they'd like in order to earn more raffle tickets. 2. Make a brag board. 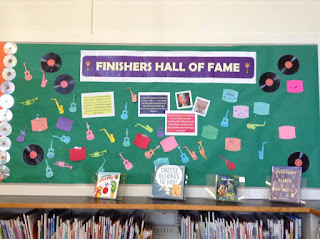 I have a bulletin board dedicated to finishers. Those who finish summer reading get to add their name to the board, and I'm hoping the board is very full by the end of the summer. 3. Encourage enthusiasm. I ask all volunteers and staff who work at our summer sign up table to be enthusiastic with the kids. That enthusiasm must be present when kids receive their halfway prize and even if they stop in just to chat. Kids are much more likely to bring back their paper for a finishers' prize if they know the person behind the table will celebrate with them. 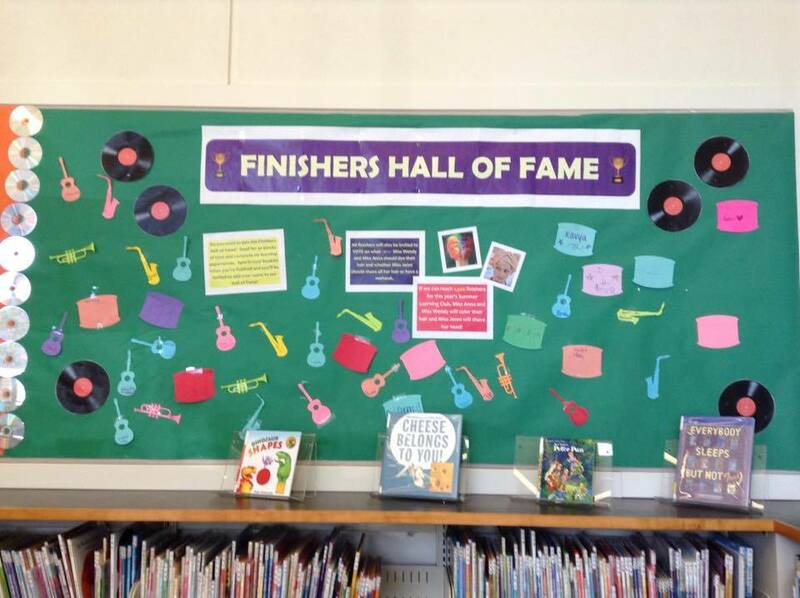 What do you do to encourage kids to finish your summer reading program? My Page Turners (9-12 year olds) read Throne of Fire this month, and I had several activities available for them. Because of the Egyptian focus of the book, I kept my activities on that theme. 1. Wanted Poster for your favorite villian. I have a wanted poster that I have used for several different activities, so I pulled it out again for this program. 2. Make a comic strip of your favorite scene. 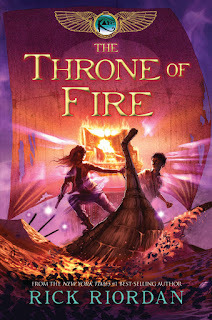 Again, this has been used before, but it fits here, especially as many of Riordan's books have been turned into graphic novels. 3. Egyptian gods fortune teller. Remember cootie catchers? 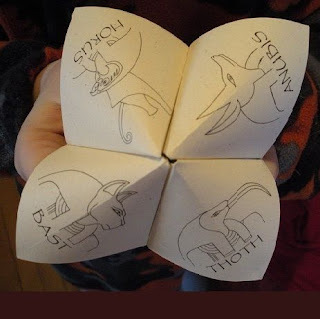 There is a "fortune teller" made the same way that has Egyptian gods listed on it. 4. Write a message in hieroglyphics. This I expected to be more popular than it was. It ended up being a "take home the handout to do on your own" kind of thing. 5. 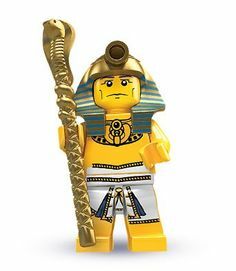 Build an Egyptian monument. I already had a large collection of LEGO bricks amassed in the library, so it wasn't a big deal to use them for this particular program. The LEGO bricks were by far the most popular of the activities I offered at this book club. 1. Rock-Hopping: Tacky loves rock hopping, so I made a hopscotch board on the floor using painters' tape. This was a very popular activity. Do you see the gravity-defying level? I had to take a picture of this tower. 2. Ice-block Building: Jenga was the closest I could come to building with ice blocks. 3. Napkin Folding: Origami, complete with instruction books from our library's collection. 4. Tablecloth Decorating: We had some old white handkerchiefs in our craft closet, so I brought those out along with fabric markers, and Voila! instant project. It was neat to see how excited the parents were about this particular activity. I considered making a tacky photo booth with Hawaiian shirts and various props, but the four activities above were very simple and didn't cost anything, since we already had all of the supplies at the library. This week in science club we talked about the Titanic. I mentioned how the ship was supposed to be unsinkable and what happened that caused the unsinkable ship to sink. [I did skim over the whole "lots of people drowned and it was really sad" part.] We watched a very short video explaining the compartment system in the bottom of the ship, and then it was time to experiment! I set out a lot of materials on each table: markers, tape, glue sticks, scissors, foil, string, pipe cleaners, craft sticks, straws, printer paper, etc. 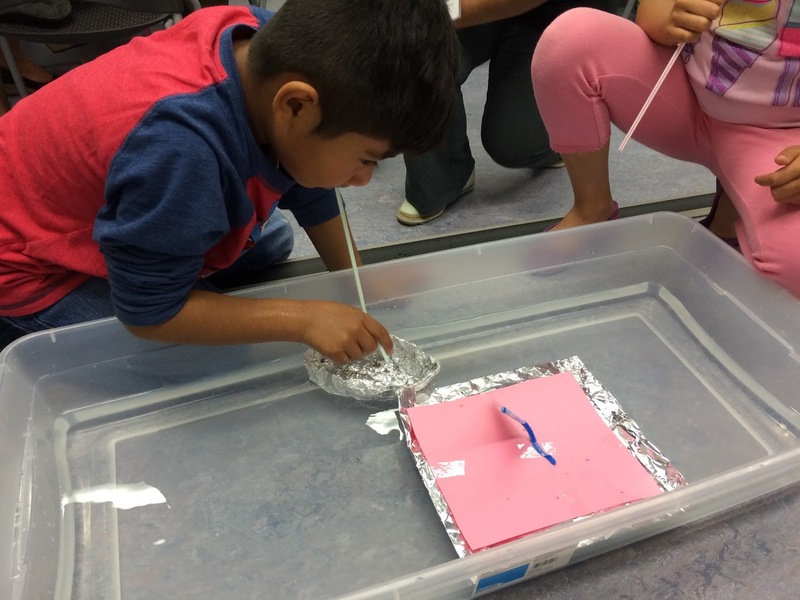 The children were told to try to make a boat that can float in water. If they wanted an extra challenge, they could try to make a boat that would hold a "passenger." I had ten plastic rats I purchased on a Halloween clearance sale, and our rats were going to be our boat passengers. There were three buckets set up at the front of the room so that kids could test their boats, adding one passenger at a time until the boat sank. This was a very popular experiment. I applauded and photographed the kids and their successful boats, and many of them went on to make another, different boat. Those who were not successful were still encouraged to try again, and most kids had at least three turns up at that water buckets. Some even made boats that were able to hold all ten rats, so I definitely would want to have a heavier "passenger" option if I repeated this experiment. Interest in science club is definitely growing. One of the kids told me she had practiced before coming to science club: "I threw an apple in the water and it sank because, you know, it had all its guts inside and was really heavy." [Note: I know that apples generally float, and I didn't get details about why this apple had special sinking guts.] I am hoping to continue this program throughout the school year, perhaps on a monthly basis. You can access my Titanic slides here. Our third science club meeting was all about geysers. I showed a short video on the geysers in Yellowstone, then it was time for science to happen. For this meeting, I did both a demonstration experiment and a group experiment. The demonstration experiment involved 2-liter soda bottles and balloons. If you place a balloon inside a soda bottle but use it to cover the opening in the bottle, you can inflate the balloon by blowing into the bottle. That is, you can do it if the bottle has other holes in it. Otherwise, pressure just builds up inside the bottle and has nowhere to escape. I used four bottles for this project - two of them had holes in them and two did not. I put blue balloons on the hole-y bottles and red ones on the regular bottles, then called four volunteers to the front to try and blow up the balloons. I explained why it worked (or didn't), and suggested to the kids/parents that they could try this experiment at home as well. Then it was time for our group experiment. 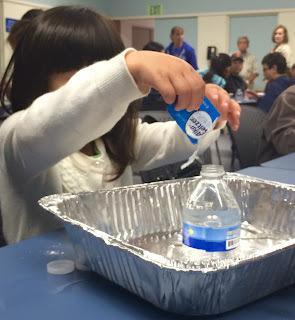 For this experiment, every table needed a pan or container for water, small water bottles for each child, and lots of Alka-Seltzer tablets. We broke the tablets, put them in the water bottles, and covered the bottles with our hands to build up the pressure. Then we removed our hands and watched the geysers erupt! It turned out that this experiment works better if you put the lid back on the bottle and/or shake the bottle a bit, and it would definitely have helped to have more Alka-Seltzer tablets. I had 72 packets, which was enough to give each child one packet, but most of the kids wanted to repeat the experiment. One thing I did with this experiment, in light of the drought situation here in California, was I asked the children to empty their extra water and used water into buckets I had placed in the front of the room. I did some research and determined that Alka-Seltzer is not harmful to trees, so when we were all done with the experiment, I had a couple of volunteers take the water outside to give the trees a drink. One of the children at science club actually applauded when I mentioned that I would be doing this for the trees. If I were to do this experiment again, I would double the number of Alka-Seltzer tablets to make sure there was enough for everyone to have a second try. I would probably also buy extra balloons for kids who wanted to try the 2-liter bottle experiment. You can access my geyser slides here. For our second science club, we studied how hot air balloons work. I followed the same format as before: explanation, video, instructions, experiment. I also added a looping slideshow on our projector that advertised upcoming library events, which gave people something to look at as they waited for the program to start and also allowed me to promote the many things we have going on for kids and families this summer. The experiment this time was pretty open-ended: given a helium balloon with a ribbon attached, create a basket that you can attach to the string. Make it light enough that the balloon still floats. For kids who finish that, I encouraged them to add "passengers" to their baskets - in this case the passengers were pennies that I brought in for them to use. I gave each table a box of scissors, markers, glue sticks, craft sticks, tape, pipe cleaners, and string, and I also supplied both sheets of aluminum foil and standard printer paper. It was really neat to watch the way the kids worked. Everyone had different ideas of what to do and how to make the best "basket." One parent said, "So, are you going to show us how to do it?" I didn't. I wanted everyone to find out what worked best, and that's better done when I stay out of they way. I gave suggestions to frustrated kids and took pictures of successes. In the end, everyone left with a helium balloon attached to some manner of basket, and they learned a lot about how the lift of an object can be impeded by the weight of another object. You can access my hot air balloon slides here. 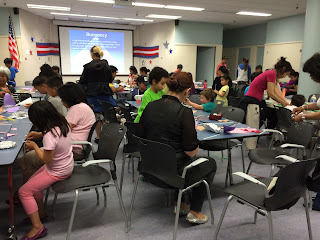 This summer I decided to add a science club to our usual summer learning club lineup. I wanted an activity that was appropriate for the older kids, that would encourage children to work together with each other and with their parents, and that would provide a learning experience while also being a lot of fun. Thus science club was born. Each week follows the same format: I begin with an explanation of the science concept we're studying, followed by a short video reinforcing what I have said. After the video (I usually shoot for five minutes or less), I explain the day's experiment, pass out supplies, and proceed to circulate throughout the room to answer questions or photograph successes (and failures). For the first week I decided to do a less complicated and not supply-heavy project, as I wasn't sure how many kids I would have at the program. At the beginning of the program there were maybe a dozen kids in the room, but by the time I had finished my explanation and the video there were nearly fifty. Our first topic was color and how colors combine to make white light. The kids made color wheels and spun them to see the white light that is produced when colors are mixed together. We had to experiment with the length of the string and the speed of the spin, but many children were able to be successful with their experiment. Divide a circle into sixths. Get these as close to perfect as possible. Glue the circle to a piece of cardboard and cut it out so it will be stiffer. Punch two holes near the center of the circle. You can use the end of a pair of scissors to do this. Thread a string through the holes and tie a knot in the string so it makes a loop through the circle. Hold one end of the string in each hand and spin the circle kind of like you are turning a jump rope. When the string is wound tightly, pull the ends so the circle spins. It might take several tries to make this work. When the circle spins fast enough, the colors blur together to make white. It's really neat to watch the looks on kids' faces when they finally get it to work.